The basic principle of any mask is very simple: Isolation (Proper Seal) and Filtering. The function of the mask is to force all the air entering the breathing zone through the air filters. This can only be achieved if the mask form a good seal with the face. “Good protection is built on two factors: a good filter and a good seal“. Surgical masks were designed to reduce the spread of germs from a patient, it is not designed to prevent air-borne contamination from entering the bodies. 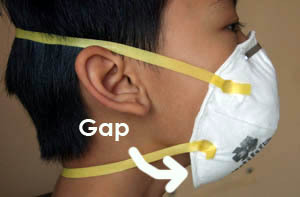 There are numerous gaps between the mask and the user’s face, allowing viruses or pollutants to pass through easily. Surgical masks were designed to protect nurses and surgeons from blood contamination during an operation. 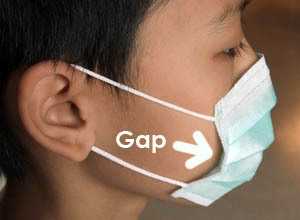 In Japan, it’s common use was to reduce the risk of passing the Flu virus around by the wearers. N95 mask effectiveness: Fit Testing is a problem. Respirators, on the other hand, were designed to protect the wearer from airborne viruses. This is possible if the respirator provides a good seal on your face, making sure that the air you breathe, will only pass through the filter(s) before entering your respiratory system. A proper fit test can be conducted by a trained specialist with proper equipment, which is usually inaccessible for the public. Some manufacturers suggest a “User Seal Check”, which is performed by blocking the filter(s) while blowing into the mask to feel if any air is leaking from the sides of the mask. Such practice is questioned by a study from the Price of Wales Hospital in Hong Kong. The study showed a 25% failure rate when trained users applied the “User Seal Check”. This technique recommended by most manufacturers is too ambiguous and unreliable. “It’s usefulness as a pre-use test must be questioned.”, the study concluded. 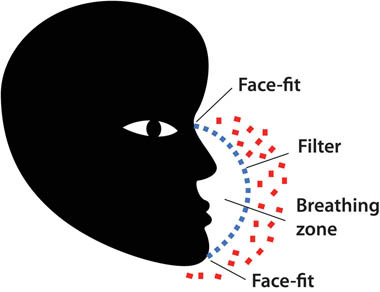 Another large scale study, “Fitting Characteristics of N95 Filtering-Facepiece Respirators Used Widely in China” found that over 90% of the participants were not able to pass the fit test as required by the standard. While looking for a respirator to protect his children, Francis Chu, the inventor of Totobobo Mask, encountered the same frustration as all the other parents. He became aware of the many difficulties that parents faced and determined to come up with a solution for everyone. He applied his expertise in product designing and experimented with hundreds of prototypes, before coming up with an ergonomic design that fits most users and more importantly, customisable and children friendly. He understands that apart from good seal and filtering, other factors like comfort, cleaning, reusing and portability are also important points to be considered before the product can be considered “Child Friendly”. 3 Reasons why Totobobo mask are superior! Totobobo mask is transparent, for a good reason. Most masks are made of opaque material, it is not easy to determine if there is small leaks between the face and the mask. Totobobo mask solve this issue with a simple method to visualise the seal and the leaks. Through the transparent mask, the user can easily check the seal with a bit of watermark. First the user wet the face with a dampen cotton wool. Where the mask touches the skin, the frosted surface turns into transparent, immediately indicating a good seal. Disposable N95 masks and cloth based mask gets reuse for some times. The contamination and germs accumulated on the mask after each use can be a thread to health. Disposable mask cannot be wash, and cloth based masks are not easy to dry after wash. Totobobo mask is made of a soft plastic with embedded anti-virus silver ion. The Silver ion agent stop the grow of germs and the mask is easy to wash clean and dry for immediate reuse. Childhood is a fast growing period, their face size change rapidly and extends a wide range. To address this size range, most manufacturer come up with different sizes, such as S,M and L. However, it is not easy to determine which size before you open the package and try the mask on your kid’s face. Most shop don’t accept returned product due to personal hygiene consideration. The unique solution that Totobobo mask offer is to allow the use to trim the mask according to the size of the face. You can even download a “Totobobo mask simulator” to construct a paper model of the mask to test the cut and the sizing before you purchase. Parents and school teachers from different parts of the globe have discovered this new solution for their children and students. If you are looking for an effective Respirator to protect your children, Totobobo Mask is exactly what you are looking for! After Chemo, Kayla’s Immune System is still compromised. This mask is our safety net that has proven its workability. “When Kayla did not have the mask and went to school, she ended up in the hospital for two weeks, every month, for three months, a total of 45 days. With the mask, she had no sickness, no hospitalizations, no colds, nothing. Debbie, the mother of Kayla, knew that she needed proper respiratory protection if she wanted to play with other children. She had her tried all sorts of masks, Surgical Masks, N95 Masks, but none of them worked. Due to her weakened immune system after the Chemotherapy, Kayla would fall sick easily after she mingled around with other kids. Determined, Debbie continued to search for a solution. One day, a Google search led her to Totobobo mask. After studying the website, she decided to give it a shot. To her surprise, the Totobobo mask worked! How to customize TOTOBOBO mask for your children? How to wash TOTOBOBO mask for reuse? How to check the mask-to-face-seal without fit-test equipment?